In May, President Obama signed an executive order protecting new federal buildings from wildfires using the 2015 International Wild-land-Urban Interface Code (IWUIC). The order will mitigate wildfire risks to federal buildings (5,000 sf or larger) located in the wild-land-urban interface by requiring that wildfire-resistant design provisions as explained in the IWUIC 2015 or equivalent code be used. Such provisions will also increase the safety of building occupants and better protect personal property in the face of fire. Threat of wildfire is increasing. In 2015, more than 68,000 wildfires burned more than 4,636 structures and 10 million acres — the highest number of acres burned on record in the US. Canada had a record-setting year, too, with 122 fires burning through more than 1 million acres. Longer, drier summers will likely continue to produce more ignitions and larger, longer burning fires. Annual estimates on structure loss due to wildfire have increased dramatically for more than 60 years. In SMART|dynamics of masonry, v2.1, Nancy Partridge, who at the time was the executive director of the Rocky Mountain Masonry Institute, wrote Designed to Burn?, an article explaining the development of the IWUIC, how it works and how masonry wall systems are well suited to meet code requirements. Unlike other life safety codes, the IWUIC is not necessarily designed to give occupants time to evacuate, but rather to mitigate the hazard from fires through provisions that protect public health, safety and welfare without significantly increasing construction costs. 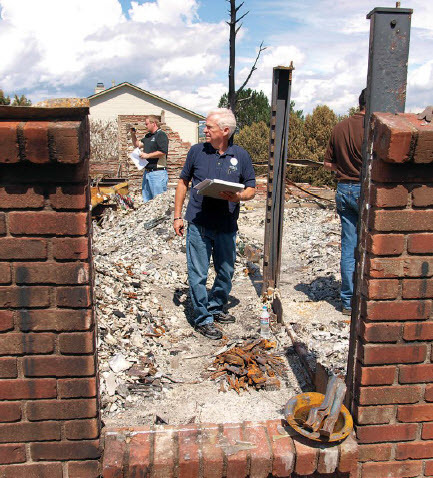 Partridge explains that building materials and design details make a difference: Brick, block, natural and manufactured stone are all noncombustible materials and with proper detailing, a wall system can be designed to withstand the full cycle of a wildfire from the pre-fire front through the post-fire front. For an average CMU wall with brick veneer, the fire rating calculation according to NCMA Tek 7-1C would be R = (R1 0.59 + R2 0.59 + A1)1.7. Where R1 is clay brick with a value of 1, R2 is grouted block with a value of 2, and A1 is the airspace with a value of .3, giving a final result of R = (2.8)1.7 or R = 5.77 hours, which is nominalized to 4 hours.